In 1980, Rod Hershberger co-founded PGT® Custom Windows + Doors on the promise that “we say what we will do, and we do it.” After Hurricane Andrew, the PGT® team worked with Miami-Dade officials to develop building codes that ensure structures can withstand some of the fiercest storms on the planet. Working from these standards, PGT® became the first company to offer a full suite of impact-resistant window and door products. Today, PGT® is the nation’s leading manufacturer of impact-resistant windows and doors. 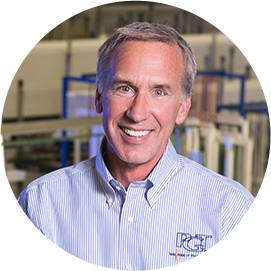 While the company has experienced incredible growth over the past 35 years, Rod has never lost sight of the people who drive this success. Don’t forgo long-term customer relationships for short-term profits.